The caterpillar of the swallowtail butterfly, with evidence of its enormous appetite. Last month I stopped by Possum Trot Tropical Fruit Nursery, and as usual, brought my camera. I look forward to those visits, because there’s always something new happening. Walking around with Robert Barnum looking at trees and plants never gets old. 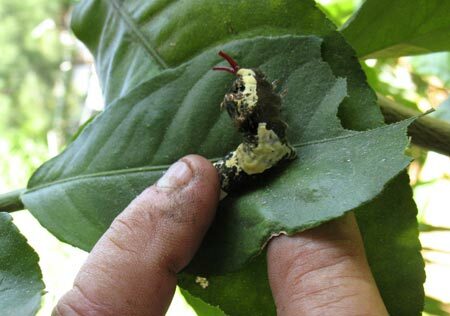 Robert pointed out something that looked like a massive bird dropping on a leaf, a blotchy browish-black and white blob, and said it was actually the caterpillar of the giant swallowtail butterfly. It was the biggest, ugliest caterpillar I had ever seen. And it had been quite busy, was chewing up large chunks of a Ponderosa lemon seedling’s leaves. In fact, they like eating citrus leaves very much, which could be a problem. Citrus greening is killing local citrus trees, so there goes its food supply. Touching the caterpillar triggers a defense response. The caterpillar’s ugly looks were actually its main defense from getting eaten. A bird would look at that and wouldn’t think it’s food. The caterpillar also had another way of defending itself, Robert said as he touched its back. It immediately arched up a bit and something that looked like a red forked tongue came out of one end. It’s called an osmeterium and it gives off a noxious odor to repel its predator. Robert asked if I wanted to smell that finger, but I shied away, no thanks, take your word on it. That was in May, and by now the caterpillar and its buddies have most likely decimated the lemon sapling and any others nearby, gone through their chrysalis stage (which lasts about 10-12 days) and are most likely now transformed into the giant swallowtail butterfly. The adult butterfly has a wingspan of 4 to 6 inches, and it’s breathtaking to see a butterfly that big in flight. 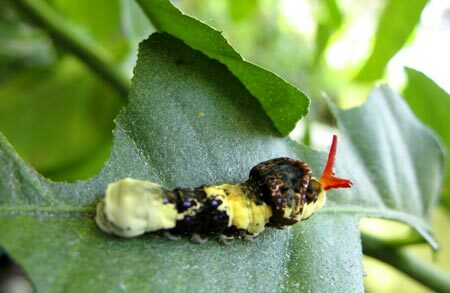 A stressed swallowtail caterpillar displaying its osmeterium. 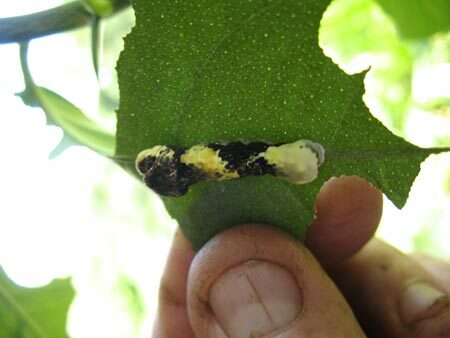 There are native citrus relatives (Zanthoxylum species) that are the original local larval hosts for the Giant Swallowtail, and though those are endangered by habitat destruction they continue to provide support. And citrus greening is still a local phenom, so the Giant Swallowtail has other places to live. Hopefully greening will be limited to this area and become the same kind of non-issue that lac lobate scale has turned out to be. There are several varieties that grow here. Zanthoxylum flavum (aka Yellowheart or Satinwood) is the friendliest, a beautiful small tree, but somewhat hard to find. Zanthoxylum fagara (Wild Lime) is easy to grow and frequently seen in native plant sales, but it is quite thorny so best used as a background plant, or on a property line with a neighbor you don’t like. You can get native plants from several local nurseries that specialize in them, and at FTG on plant sale days from the Dade Chapter of the FL Native Plant Society. Also at all meetings of the FNPS (fourth Tuesday of every month except August, Pinecrest Gardens, 7:30pm, always free and open to public) there is a plant raffle, 3 tickets for $1, great way to get plants and learn about natives. I should correct: I believe the next regular meeting of DCFNPS will be September 27th. You can get info and find a listing of native nurseries at http://dade.fnpschapters.org/ or go to Facebook http://www.facebook.com/dadefnps for more info.